This year’s César for best short (category of ‘Meilleur film de court-métrage’) went to “La femme de Rio”, directed by French filmmaker Emma Luchini (36). It was her second short after “Sur ses deux oreilles”, another award winning short she made in 2007. Now, this resourceful screenwriter and skillful director is the creative and driving force behind the latest French drama/comedy “Un début prometteur”, which stars Manu Payet, Veerle Baetens, Zacharie Chasseriaud and Luchini’s father Fabrice, a celebrated leading and supporting screen actor in France for more than four decades now. 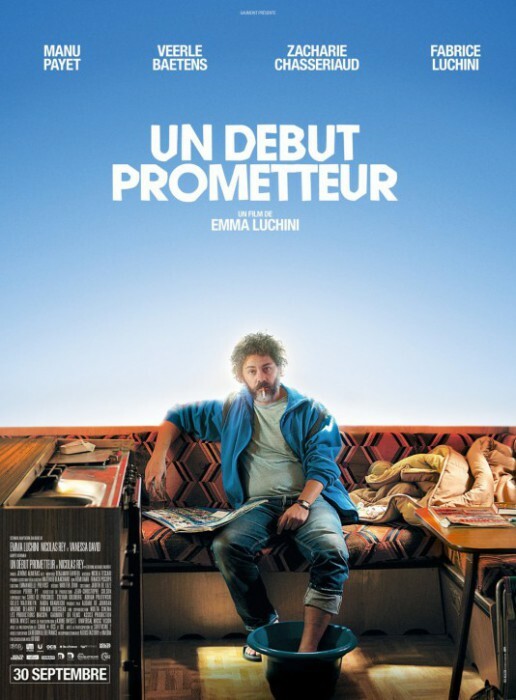 “Un début prometteur” is Miss Luchini’s second feature, after she made “Sweet Valentine” (2010), also une comédie dramatique, starring Vincent Elbaz, Vanessa David and Louise Bourgoin. It’s almost a tradition in France: there is nothing unusual about French women film directors, considering that Parisienne Alice Guy (1873-1969, also often credited as Alice Guy-Blaché and Alice Blaché) was the world’s first female director with over hundreds of (mostly) shorts to her credit from 1897-1908 in France and from 1910-1920 in the US. From Agnès Varda to Claire Denis, Coline Serreau to Agnès Jaoui and Josiane Balasko, women have always been able to make their presence felt in French cinema. Emma Luchini is one of France’s many young and new wave talented filmmakers, a generation which includes Anne Fontaine, Julie Gavras, Sophie Fillières and actresses such as Audrey Dana, Sandrine Bonnaire, Julie Delpy or Mélanie Laurent who also ocasionally end up in the director’s chair as well. Can they eventually offer better and stronger parts to actresses? Do their films contribute to changing the way we consider women – not women as girls but women as equal individuals on screen? 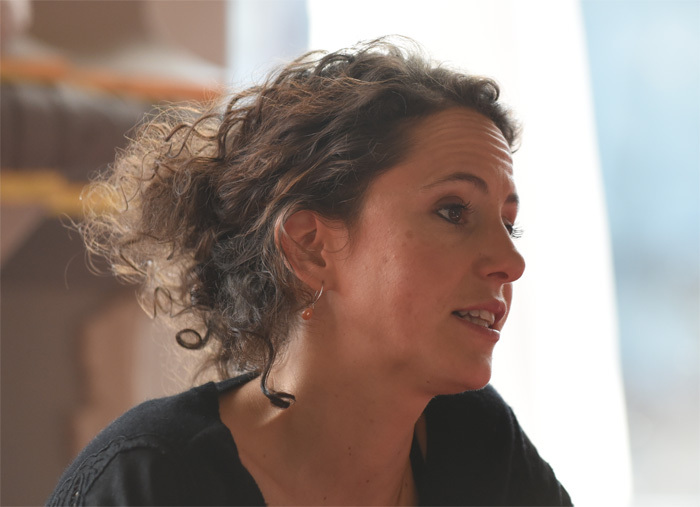 Miss Luchini certainly made her point in “Un début prometteur” by having the guts to cast Flemish-born actress Veerle Baetens in the leading role as a mysterious character who strongly influences her male co-stars. Powerful female leading roles have always been part of film history’s legacy, but internationally, it often took only the very best, the very brave and august film directors such as the prominent Fred Zinnemann (1907-1997) to make powerful statements, all done tremendously well, by making films such as “Teresa” (1951) with Pier Angeli in the title role, or casting Ethel Waters and Julie Harris in “The Member of the Wedding” (1952), Audrey Hepburn in “The Nun’s Story” (1959), and Jane Fonda with Vanessa Redgrave in “Julia” (1977, with Meryl Streep in a small part in her film debut). Highly interesting to see Emma Luchini as a young and ingenious filmmaker who’s following in the footsteps of her French colleagues. Miss Luchini, how do you start on a brand-new film project? Well, to begin with, I think there are three stages in a film in progress: first you got the writing process, when you think things over, you constantly reflect and at that point, I never consider any actors for any role. This is a two-dimensional literary phase and I only work with the novel, with memories and ideas. A script is a literary object. Then you go to the next phase which I’m very passionate about: the casting, which is a three-dimensional phase. You start to meet the actors you’d like to work with and you spend an awful lot of time with them. Getting the character in the actors and vice versa works very well with inspiring actors, you’d be amazed to see how much they can offer to enrich their character. This is the third step when the actors really get into character. You see things improving when you collaborate with your actors very intensely. Making a film is really all about working together very closely. And as a filmmaker, you have to keep in mind what you are trying to say with your film. Manu Payet was the first actor I had chosen, because he sort of personifies the film: he’s a melancholic avec panache, with a kind of lightness too, and that’s why I considered of casting a comedian. And Veerle Baetens, I had seen her in “The Broken Circle Breakdown”  and I thought she would be perfect for Mathilde, especially after I had found out that she spoke French: she was sensual, feminine and vulnerable. And she was mysterious because of her accent that’s difficult to track down. Zacharie Chasseriaud was cast by my casting director. I had met several young actors and had two of them that I wanted to consider for the part of the younger brother. But once Manu and Zacharie had met, it only took them about after thirty minutes before they were like brothers. What about the casting of your father? I had a long list of actors with me, but then I realized that my father met all the criteria of the character of the role of the father in the film. I wasn’t sure if he’d accept the role, but he did and it was so much easier to work with him than I thought, because we know each other so well: we share the same history and the same feelings. But I never looked at it from the point of view of actually directing my father. After all, he has worked with so many impressive directors, and he has this very long career [he was nominated nine times for a César, and won in the Best Supporting Actor category for his role in “Tout ça… pour ça” , directed by Claude Lelouch]. When you are writing the script, you have an idea of what your film is all about. To what extend can actors or members of the crew make suggestions to change or adjust little things here and there, without losing the focus of your original concept? That can be complicated, that’s true. It’s like driving a car and you have to change lanes, you have to move along with the traffic but in the meantime you have to extremely careful. Making a film is not quite like writing a novel: so many things can interfere. And also, if you make a film, make sure you keep the script alive. Any script should be alive and if necessary you should rewrite scenes, the shooting process has a history all on its own, and you have to be alert about how can you combine this with the script to make sure that the films gets better – without interfering with the original idea. The backbone of the film should remain intact. When you write your script, is it a slow or a fast process? Very slow! I write, I do many other things in the meantime – it’s a creative process that goes very slowly. You also need to give it time to grow. “Un début prometteur” has a perfect balance between tragedy, drama and comedy. How difficult was it to make sure you kept all those ingredients in balance? It’s exactly what I had in mind and it’s also what I like in literature. But you never know if it works until the audience gets to see the final result. But I do know that the topics in the film are pretty serious, and the way you present it to the audience, when using a light touch, can always make a difference. Are you already working on a next project? Yes, I am writing my next script, which will be an original script. Well, I always have numerous ideas that I am working on. The script of “Un début prometteur” was based on a novel because I fell in love with it, but I don’t mind trying to write something entirely new. Have you ever thought of becoming an actress and be a colleague of your father? I have thought about it, but I would never do it. I’m too much of an introvert (laughs). At first I wanted to become a writer, and then I also became a director and I’m perfectly happy with it now. Emma Luchini and her father Fabrice Luchini on the primetime news, September 27, 2015, on the TV channel France 2, talking about “Un début prometteur” and comparing the film’s leading lady Veerle Baetens with legendary French screen icon Arletty (1898-1992) who appeared in Marcel Carné’s film classics “Hôtel du Nord” (1938), “Le jour se lève” (1939) and “Les enfants du paradis” (1945). Posted in Director-screenwriter, Film Talk and tagged Agnès Jaoui, Agnès Varda, Alice Blaché, Alice Guy, Alice Guy-Blaché, Anne Fontaine, Audrey Dana, Audrey Hepburn, César, Claire Denis, Claude Lelouch, Coline Serreau, Emma Luchini, Ethel Waters, Fabrice Luchini, Fred Zinnemann, Jane Fonda, Josiane Balasko, Julia, Julie Delpy, Julie Gavras, Julie Harris, La femme de Rio, Manu Payet, Mélanie Laurent, Meryl Streep, Pier Angeli, Sandrine Bonnaire, Sophie Fillières, Sur ses deux oreilles, The Broken Circle Breakdown, The Member of the Wedding, The Nun's Story, Theresa, Tout ça... pour ça, Un début prometteur, Vanessa Redgrave, Veerle Baetens, Zacharie Chasseriaud. Bookmark the permalink.